Almost as old as internet gambling itself, 888 has roots going back to 1997, and they have picked up plenty of experience along the way. This shines through in their sportsbook which offers a huge number of betting eventualities with a lot of depth from one event to another. The ability to live stream an impressive number of events is another string to this bookies’ bow. They offer a site that is a pleasure to use and an equally impressive mobile package, giving bettors everything they need to quickly place a wager wherever they are. The odds may not exactly be mouth-watering, but a savvy player can squeeze more out of them using associated offers. Their reputation may have begun as an online casino, but the sportsbook can easily hold its’ own in a sea of competition. 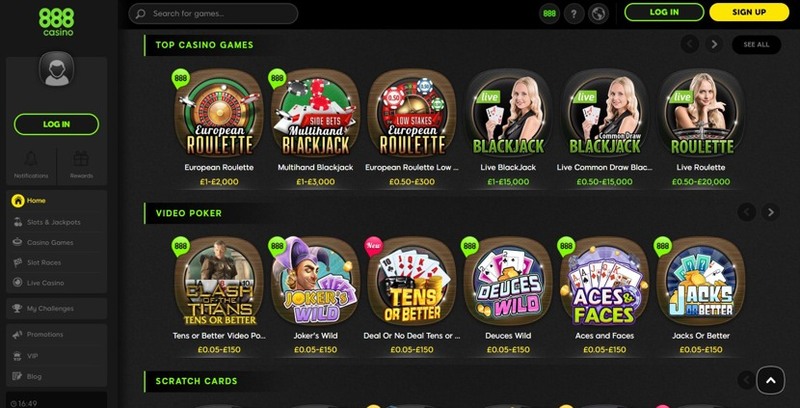 Having existed since the year dot in online gambling terms, 888 have a very good idea of what events and markets their customers want, and they provide these in abundance. A solid list of 30+ sports covers all of the usual suspects as well as a few lesser spotted options such as Cyclo-Cross, Chess, and Trotting. Football is streets ahead of the rest when it comes to range and depth of markets, while Ice Hockey and Basketball also prove popular. 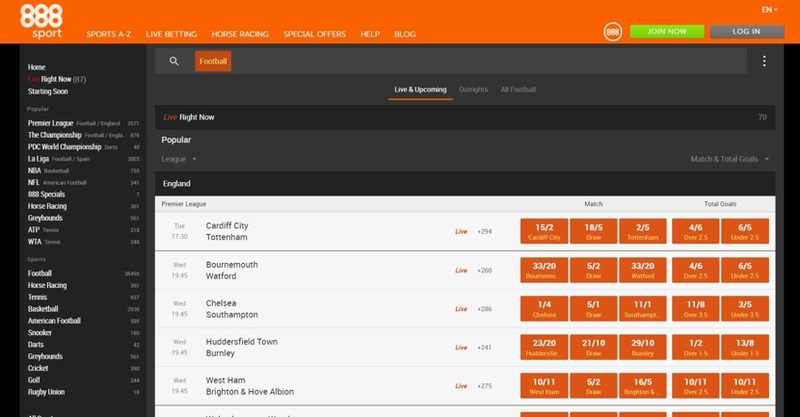 In general, though, any mid-level event will be available to bet on providing they cover the sport in the first place, and even local football matches should have a good 25+ lines available; big games, on the other hand, can get close to 300, so you can bet on practically every kick of the ball and get really creative with your acca’s. We didn’t see much in the way of specials (Next Manager to Quit, for example) but there are a few novelty and entertainment bets thrown in for good measure, although this isn’t their forte. The stats tool could come in extremely handy, though, as it goes into a ridiculous amount of detail – you could get lost for days in there. The odds available are safe enough, your mates aren’t going to laugh at you, but to get the best value you should try and combine them with some of the offers where possible. Enhanced odds are a regular occurrence and as you would expect from a bookie of this size BOG is available on UK and Irish Horse Racing. You can also bet on ante-post races from as far afield as South Africa and the USA. The live area of the site functions very well indeed with an impressive amount of in-game information once you have committed to an event. The live stats can shed a lot of light on the situation, too, if you are someone who likes to get into the nitty gritty. The interface gives the punter a certain amount of control by using collapsible menus so that only the desired betting lines need be on display, and the decision on whether to expand the event full page or to also keep one eye on other in-play events lies with the punter. It’s fair to say they don’t always have the greatest depth of markets out there for in-play events, but they are certainly better than many, and the odds update quickly with clear red/green pointers indicating activity. 888 also employ an Instant Betting feature, allowing punters to bet on an event in the next 60 seconds, for example; so you could bet that a throw in might occur between the 50th and the 51st minute. This is really fun if you are watching the match at the same time and it provides instant results. Speaking of watching the game, live streaming is supported at 888 and it tends to be pretty good too. This is a major bonus for a lot of bettors who want their betting experience to be more immersive and exciting. To watch the horses you will need to bet at least £1 on the race in question and almost all are streamed, while events in other categories are also well covered. In fact, some sports that don’t even get a look in at other bookies are available to stream at 888; Badminton, for example. You can fund your 888 account from seemingly every payment method ever created, we hadn’t even heard of some of the options. Oddly enough Paysafecard was absent from the list but other prepaid cards were available if that is your thing. Usually, withdrawals will have to be made via the method the deposit came from, but you can withdraw as little as £3 and there are no maximums stated. Daily/weekly/monthly limits may well apply, but if you have a big win just get in touch with them, they are a big enough company to be able to work something out so you get your money quicker. The bad news is that processing times are much too slow and you can cancel withdrawals up to 24 hours after requesting them too which doesn’t sit right with us. 888 need to look at this again. They do so well in almost every other aspect but banking severely lets them down. This is not an exhaustive list, just a few features we have picked out that we like personally. 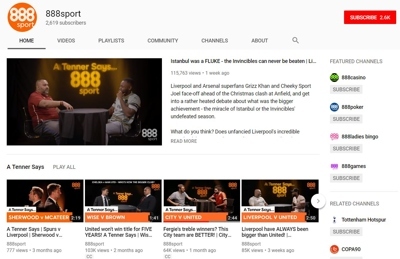 888 seem to be doing a fair amount of social engagement with their players which is good to see, and it’s clever too since it makes them more of a one stop shop for sports fans. We love a good blog, and this is a good blog. There are loads of articles in here and they don’t just cover the most popular sports either. Sure, you will find more to read on football and tennis, but there are articles on cycling events and E-sports too, for example. These include opinion pieces, general advice, and betting tips from people who know what they are talking about rather than relying on Gary from down the pub, or Jim who works in accounts and who also got roped into doing the blog. This is great fun and fantastic for engagement, and they often embed videos from their channel into their blog, too. Super fans from opposing teams are brought into the studio to talk about current events or hypothetical situations, often with hilarious results. You will also hear the opinions of ex-pros on various aspects of the game. Away from football there have been interviews and coverage from the Cheltenham Festival as well as an impressionist sending up famous folk from the sport world. It’s a real mixed bag but it’s all interesting stuff. One feature that is fast becoming expected these days is cash out. It’s not available on everything but will be clearly indicated with a green button when it is. Cashing out is all about controlling your bet, and allowing the bettor to react to the events of a game. This has another effect of making the bet more exciting and therefore increasing entertainment value. You might put £10 on your selection only to decide mid-game that you no longer think they are going to win. You could cash out (settle the bet early based on the current situation) and get some of your stake back. It works the other way, too. 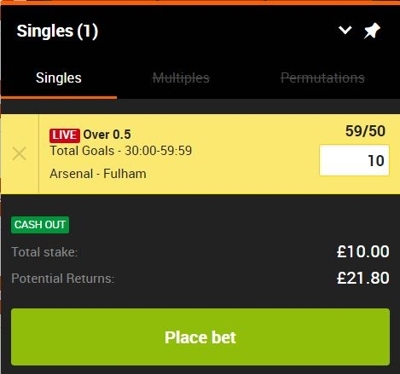 If your selection was doing well you could cash out and take a guaranteed, albeit smaller, profit rather than wait it out and potentially see the tables turn. Note: 888 will only allow you to cash out once the event has started. Some bookies let you do this pre-match which can be useful if your prediction is based on a specific player and it comes to your attention that he is injured before the game, for example. The same concept as cashing out but you can split your bet in two, leaving a portion in at the initial odds and settling another portion at odds based on the current situation. These odds fluctuate very quickly once the game is in play as the situation is developing all the time, so you have to think and act fast if you want to take advantage. It gives the punter even greater control and opens a whole new world of possibilities. 888 are probably better known for their casino than for their sportsbook, and with 20+ years in the game they are something of an expert in this area. The casino offers a selective yet diverse range of slot games and jackpots, as well as table and card games like roulette and blackjack. The live casino is highly regarded and allows for communication with a live dealer via video link up. 888 are also in the enviable position of being able to offer games exclusive to them provided by their in-house developers. You can read more about the 888 Casino here. On the whole the website is plain and simple to use, especially when you take into account the scale of information and betting opportunities it needs to present. When you initially log in things are a little unclear, not in terms of menu structure but in terms of what is right in front of you; the design looks good but the eye doesn’t easily decipher one betting option from the next. However, once you start delving into the menu things become much clearer. 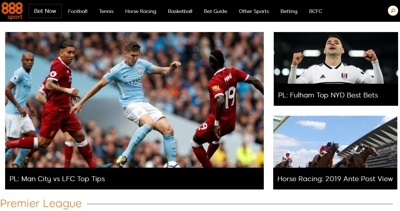 A few basic options are available like A-Z of sports, Live Betting, Horses, and Special Offers, so you start on solid ground and from there you can whittle down your options until you find what you are looking for. The list of sports neatly provides the number of events currently available alongside and once you open a category the interface is exceptional and only gets better the further you go. 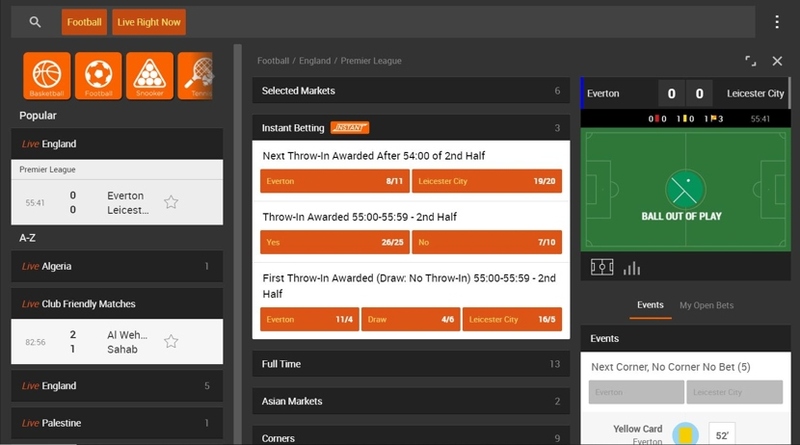 There are a lot of options to play with enabling you to zone in on specific markets or bet types, most of which is done with columns and collapsible menus, as well as some useful information pertaining to the event you are currently looking at. 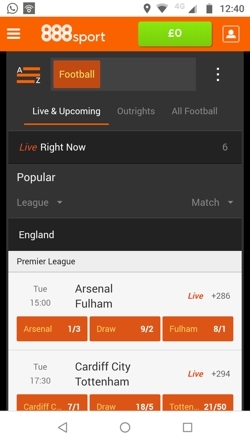 The search bar is also highly functional, allowing punters to search for specific players, teams, leagues etc, while odds can be switched on any page. 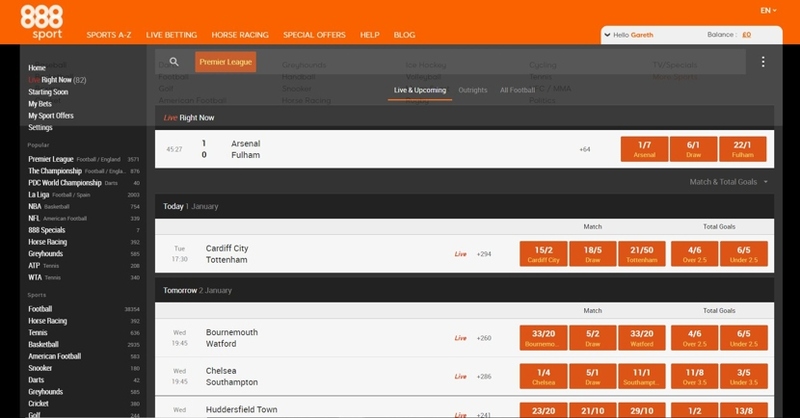 The betslip is hidden away and only takes up screen space if you need it, even then it can be minimised. The site is obviously high end, it feels professional and clean but still has life and energy to it (no doubt aided by the bright orange colour scheme), and operationally it is spot on. Money has clearly been spent here, and the result is a lean and responsive product with many working parts that operate in perfect harmony. 888 have Kambi to thank for that, for theirs is the platform that the site runs on. Kambi employ some of the most sought after engineers and developers in the business and it shows. Once you have chosen your area (Sports A-Z, Live Betting, Horses etc) everything works quickly from the single interface using three menu buttons; one for your account options, one main menu to jump between areas, and one A-Z button that is integrated into the interface. These float in and out as requested and feel progressive and intuitive to use. Make sure you are using the right menu button, though, if you use the main menu button instead of the integrated A-Z menu button to jump between sports you will have to sit through an insufferable number of page loads. Browsing for bets can be a bit laborious with lots of scrolling, but if you know the general area you are aiming for it doesn’t take long to get stuck in, and the search bar has made it across with full functionality if you know exactly what you are after. Touch ID is available for the app making access even quicker, keeping 888 at the head of the table for innovation and embracing the future. 888 are about as old as you can be in the online gambling world. It was back in the relative dark ages of 1997 that two sets of Israeli brothers joined forces to set up Virtual Holdings Limited, and from there launched one of the first ever online casinos; Casino-on-net. The ins and outs of the business since then have been incredibly complicated, but what is clear as day is that they have grown into one of the biggest online gambling brands the world has ever known. Not only does 888 operate a global sportsbook, casino, and poker product, but they own so many subsidiaries it’s almost impossible to keep up. They moved their operation to Gibraltar where they have been based since 2003, and in 2005, less than ten years after opening for business, they floated on the London Stock Exchange. There have been many acquisitions over the years as well as a few that fell through; in 2006 there was talk of a merger with Ladbrokes which, in the end, did not come to pass, and there were advanced talks with William Hill with regards to a takeover. One deal that did go through was the 2007 purchase of bingo company Globalcom Limited for $43.4 million – in cash. Only 6 months later bingo revenues had brought in $14 million for the company. Their history has not been without incident, however, and in 2017 the UK Gambling Commission fined 888 a record £7.8 million after 7,000 customers who had self excluded were allowed to keep betting for 13 months before anything was done. The company’s share price dropped 8% as a result. 888 now employs around 1300 people and boasts more than 18 million paying customers worldwide. 888 are a solid contender for your business but we would suggest having them as part of a portfolio rather than as a sole use bookie. They don’t often offer the best odds but there is value to be had with some interesting offers thrown into the mix, and the range and depth of events and betting lines won’t leave you disappointed. Live streamers and in-play gamblers will no doubt be happy here, as will those who like to eat up statistics before laying their bets. Newbies who want an easy life will find the site easy to use and should be happy enough with the prices, as long as they are aware that they are on some level trading maximum profitability for ease. There is 24/7 support available at 888 Sport which is fantastic news, although the phone line is only open 9am to midnight. Still, at least they have one, and it’s free to call. E-mails should get a quick response if our experience is anything to go by, and the live chat is quick to connect if you can find it. We did find the chat operator to be a bit on the dim side we have to say, but we got there in the end. They don’t make it easy to find live chat. We used a search engine initially but if you enter the cashier and linger then the live chat option should eventually pop up. They lose marks for this, it’s just annoying and is not a customer focused approach. The FAQ, on the other hand, is a fantastic tool that is put together well and genuinely useful, with many articles linking to others that are similar to help you on your way. Chances are, whatever your query it will have been answered in there. Phone – 0203 478 0670 for UK punters, toll free and manned 9am-midnight. 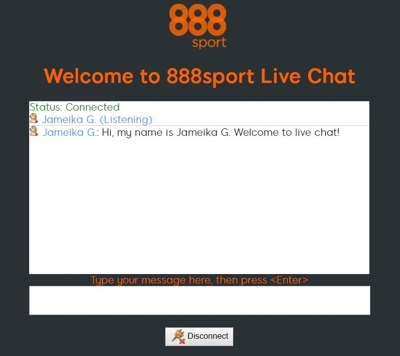 @888sport – It is more of an engagement account than a support account, but it’s a good one to follow for news and humour.